While deep discounts and daily deals can drive a large amount of hotel bookings, these flash sales can ultimately be more harmful than helpful. They force hoteliers to sacrifice substantial revenue and often only influence bargain-hunting consumers who aren’t likely to become returning guests. In fact, research by TravelClick found that a full 40 percent of hoteliers were not happy with the outcomes of their flash sales initiatives and did not plan on using this methodology again in their hotel marketing efforts. To provide marketers with more worthwhile alternatives to flash sales, MediaPost.com featured the following five strategies for effectively and efficiently filling rooms and fulfilling goals. 1. Improve Your Image with Better Images – Make sure that the property is shown in its very best light by reviewing the photos featured on the hotel website, along with pictures on third-party travel sites and other digital forums. These images can have a strong impact on hotel bookings, so update these photos to feature the hotel’s very best benefits and offerings. 2. Review Search Strategies – Make an extra effort to carefully and continually examine your search campaigns to account for seasonal bookings changes and avoid spending too much or too little. Pay close attention to search terms that have had large performance fluctuations, in addition to terms that generated low clicks with high bookings or high clicks with low bookings. 3. Leverage SEO – Develop original content to boost your search engine rankings and maximize your digital reach. Find a marketing firm that specializes in SEO to create creative content about the property and all the area has to offer, as well as optimize your linking strategies. 4. Increase Your OTA Performance – Make use in your hotel marketing of the surprisingly affordable cost-per-click programs provided by most OTA’s. 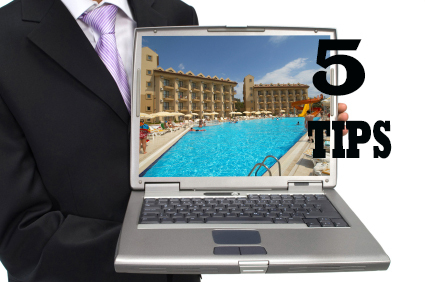 They enable hotels to land top search rankings on third-party travel sites and they only charge for clicks. 5. Come Up with a Compelling Call-To-Action – While most hotels tie low room rates into their calls to action, shift the focus away from this emphasis on discounts by using one of the hotel’s unique features to secure the booking. It will make the hotel stand out from the legions of sale-promoting properties and give guests another reason to choose the hotel. Fortunately, flash sales aren’t the only way to get guests in the door. Spare the effort and expense by using these alternative strategies in your hotel marketing to increase bookings with much more rewarding results. To learn more about the latest online trends in hotel marketing, contact MDG Advertising. At MDG, our 360° marketing approach uses just the right mix of traditional and online media to reach your hotel marketing goals. While some industries may fare better in print and others online, we strive to create a balanced approach where digital and traditional advertising efforts support each other and your marketing message is tailored to the medium. To stay on top of the latest hospitality marketing trends that will make an impact for your hotel, contact MDG Advertising.